Spring is finally here! It’s time to break out the lightweight sweaters, t-shirts, and breezy dresses. If your winter jackets, wool sweaters, and boots and still taking up your valuable closet space, it’s time to consider custom closet organizers. A custom closet will give you the room needed to organize your clothes and create a proper place store your seasonal clothing. Getting ready in the morning will be faster and more efficient when you’re no longer wading through bulky winter sweaters while looking for your favourite linen shirt. No matter how large or small your closet is, it’s important to efficiently utilize all the space you have available. Custom closet organizers can help you maximize your storage space by making use of those hard-to-reach spots. The upper levels of your custom closet can be used to store clothing you don’t wear often, mementos, and knickknacks. Narrow wall space can also be used to hang ties, belts, hats, and scarves. Convenient storage solutions will give you the peace of mind of always knowing where your items are while reducing clutter. What kind of storage solutions are right for you? Installing custom closet organizers means you always get the best storage your needs. For example, if you have large collections of shoes, handbags, or sweaters, you may want more shelving space. Shoes and handbags are best displayed on custom shelving units to reduce clutter on the floor, keep your belongings safe from damage, and make finding the right item an easier task. Some sweaters should also be folded and stored on shelving to ensure they don’t stretch out or get unsightly shoulder creases. If you need more space to hang your suits, dresses, and shirts/blouses, custom closet organizers can provide from extra hanging rods. For instance, you may want to install a double rod inside your closet to maximize your hanging space, and/or install new hanging rods on an opposite wall. Adding more space for hanging rods will mean that you don’t need to cram your clothes so closely together on the rod, which reduces wrinkles. 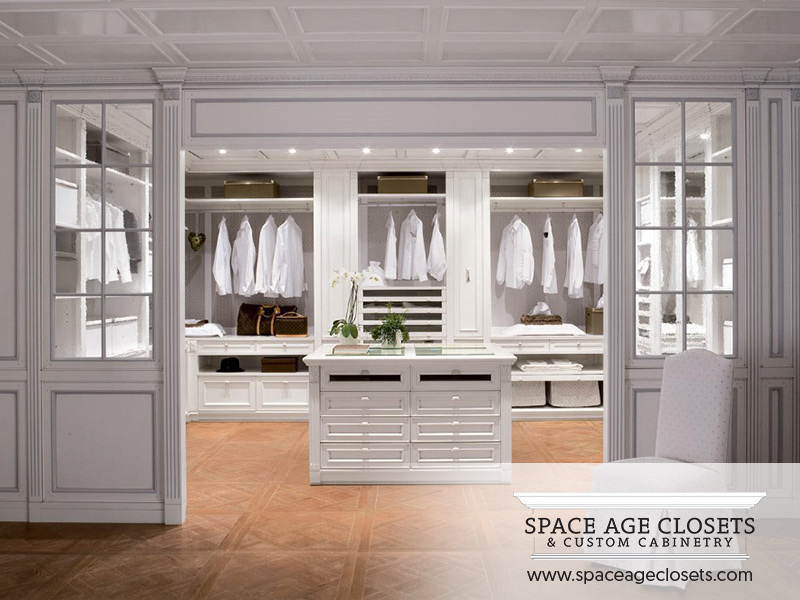 If you need custom closets in Toronto and the surrounding areas, the experts at Space Age can help. Our custom closets and custom closet organizers will help you save time getting ready and make the most efficient use of your storage space. Call contact us to learn more about our high-quality, custom storage solutions and get a complimentary consultation.